Received December 17, 2018; Revised January 17, 2019; Accepted February 7, 2019. Retrograde type A aortic dissection (RTAD) following thoracic endovascular aortic repair is a devastating complication associated with high mortality rates. In particular, a deployed endograft in a bird-beak formation in an acute curve of the aortic arch can induce injury to the fragile aortic wall, with the subsequent development of RTAD. Here, we describe an extremely rare case of RTAD caused by fracture of the bare spring of the thoracic endograft for type A aortic dissection. Thoracic endovascular aortic repair (TEVAR) has been generally recognized as an alternative to open surgery for descending aortic pathologies; however, this new, alternative life-saving treatment for clinical emergencies can cause unexpected complications, including retrograde type A aortic dissection (RTAD), which is one of the most dangerous complications following TEVAR. Here, we describe an extremely rare case of RTAD caused by fracture of the bare spring of the thoracic endograft for type A aortic dissection. A 68-year-old male patient was admitted with a complaint of sudden-onset weakness and pain in the right arm. He was found to have type B aortic dissection on a chest computed tomography (CT) scan 4 years ago and was regularly followed up as an outpatient. During the follow-up period, aneurysmal dilatation occurred (Fig. 1A, B). Two years previously, he underwent TEVAR for a complicated chronic type B aortic dissection. At that time, a 40×40×150-mm Valiant thoracic stent-graft (Medtronic Vascular, Santa Rosa, CA, USA) was placed in the descending aorta, 45 mm behind the left subclavian artery based on the greater aortic curvature (Fig. 1C, D). After TEVAR, the patient was in good condition and was being regularly followed-up through outpatient clinic visits. At presentation to the emergency department, his initial left arm systolic blood pressure and heart rate were 142 mmHg and 69 beats per minute, respectively. His initial hemoglobin level was 10.4 g/dL, and electrocardiography revealed a normal sinus rhythm. Because of malperfusion, his right upper-extremity blood pressure could not be examined, and there was no right radial pulse. The upper-extremity CT scan revealed no definite stenosis of the right subclavian artery (Fig. 2A), and an additional CT scan revealed Stanford type A aortic dissection with true lumen collapse of the ascending aorta extending to the right subclavian artery and both common carotid arteries (Fig. 2B, C). After 4 hours of symptoms, the patient’s arm pain dramatically subsided; however, his right upper-extremity blood pressure was almost 30 mmHg lower than that of the left side. Then, we found a distortion of the configuration of the previously implanted endograft in the aortic arch in the initial chest radiograph and postulated that the distorted bare spring induced RTAD (Fig. 2D). Additionally, we found that the previously deployed endograft was placed in the acute angle of the aortic arch and descending aorta (i.e., bird-beak formation) (Fig. 3). The patient was scheduled for elective operation 2 days later because he was hesitant to undergo open cardiac surgery. Under general anesthesia, the dissected aorta was exposed through a median sternotomy. The ascending aorta was clamped, and myocardial protection was achieved by means of antegrade infusion of cardioplegia. A 30-mm 4-branch vascular prosthesis was anastomosed to the aortic root. At a temperature of 28°C, the cross-clamp was removed and the dissected aorta was opened to the aortic arch until the level of the left subclavian artery. We inspected the dissected ascending aorta and aortic arch and found fracture of the previously deployed bare-spring endograft and erosion of the aorta due to the protruding spring (Fig. 4). The aortic arch was dissected at the proximal level of the common trunk of the brachiocephalic artery and the left carotid artery, and the fractured and protruded bare spring was removed with wire scissors. The 4-branch vascular prosthesis was anastomosed just above the level of the left subclavian artery because the previously deployed endograft and the dissected left subclavian artery were too deep to manipulate. All visible fragile dissected aortic tissues were removed, and the branched vascular prosthesis was anastomosed to the healthy tissues of the common trunk of the brachiocephalic artery and the left common carotid artery. The remnant bare spring and the membranous part of the endograft in the descending aorta were left anchored to the descending aortic wall. Finally, the patient underwent ascending aorta 2-partial arch replacement (common trunk of the brachiocephalic artery and left common carotid artery) and open surgical removal of the broken spring. His postoperative vital signs were stable, and no neurological adverse events occurred; however, he developed acute kidney injury and metabolic acidosis. He was awake and extubated on postoperative day (POD) 1 and started on hemodialysis in the intensive care unit. His condition gradually improved, and he was discharged on POD 37 (Fig. 5). Although he finished hemodialysis and was asymptomatic, he eventually developed chronic kidney disease. One year later, he is being followed-up at renal and cardiovascular clinics, and is asymptomatic and in good condition. Since TEVAR was first introduced in the 1990s , it has been viewed as an effective therapeutic option for the management of Stanford type B dissection and other descending aortic diseases. However, common postoperative adverse events associated with TEVAR, such as endoleak, stent-graft migration, RTAD, and new-onset dissection, require reintervention for a better prognosis and are considered its weaknesses . Above all, RTAD is a fatal complication of TEVAR, with an incidence rate ranging from 1.3% to 17.9% [3–8] and a mortality rate ranging from about 33.4% to 42.0% [3,7,9]. The occurrence of RTAD following TEVAR is associated with procedure-, device-, and aorta-related events [3,5,6,8,10–15]. A rough wire or the catheter manipulation might injure the fragile aortic wall, which is considered to be associated with intraoperative or early postoperative RTAD. Additionally, balloon touch-up is also considered to be associated with intraoperative RTAD [3,5,8,11]. Some reports have suggested that a proximal bare-spring configuration is associated with an increased risk of RTAD [3,5,6,11,15]. Williams et al. reported that RTAD is more common with the use of endograft devices with a proximal bare-spring design (4.7%). Our case also confirms that the proximal bare-spring configuration may be a risk factor of RTAD. Extensive radial force attributed to an endograft >20% oversized relative to the diameter of the aorta has also been proposed as a potential cause of RTAD following TEVAR [6,12,16]. RTAD following TEVAR is also associated with an aortic pathology and the progression of the disease. The incidence of RTAD is considerably higher in patients treated for dissection, especially acute dissection, than in those with an aneurysm . In addition, other factors associated with RTAD include a mean angle of >50° between the aorta proximal to the endograft and the top stent of the endograft . The mechanism of RTAD following TEVAR is postulated to be related to the spring-back force of the endograft; that is, when the stent is placed across the arch, it spontaneously straightens if passively curved, demonstrating the characteristic feature of a spring. Moreover, the more the endograft is bent, the higher the stress might be [3,4,11]. The patient described herein underwent Ishimaru classification  zone 4 TEVAR for complicated Stanford type B aortic dissection 22 months previously. Considering the very acute angulation of the aortic arch, a 40-mm thoracic endograft was placed in the descending aorta 45 mm behind the left subclavian artery based on the greater aortic curvature. The patient’s proximal landing zone aortic diameter was measured to be about 39 mm, and an oversized endograft was rarely applied. The thoracic endograft was covering the proximal entry by about 50 mm. There were no complications during the procedure, and the postprocedural CT scan showed that the dissected descending aorta was successfully excluded. Although the patient was undergoing regular outpatient follow-up without symptom, in this surgical repair, there were multiple erosions in the aorta due to the bare spring. We suspected that the aortic intima was slightly damaged by the proximal bare spring, which caused a minor tear during the 22-month follow-up. However, the RTAD was undoubtedly caused by the fracture of the bare spring, resulting from the combination of high stress and dynamic movement of the ascending aorta and misaligned deployment of the endograft in the aortic arch with acute angulation. Especially, the misaligned deployment in a bird-beak formation in the curving point of the proximal descending aorta might have led to an imbalanced stress distribution in the endograft, causing greater stress to be concentrated on the proximal bare spring and leading to its fracture. In the present case, we planned to perform total arch replacement, removal of the bare spring, and distal anastomosis to the previous endograft. 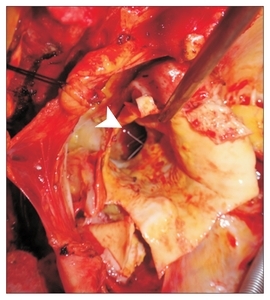 However, management of the implanted endograft was highly difficult because it was anchored onto the aortic wall, and there was no easy access to the implanted endograft and dissected left subclavian artery through the median sternotomy. However, as the patient was asymptomatic and showed no evidence of mal-perfusion, we considered this surgical repair as a partially effective treatment in this emergency situation. The patient developed acute kidney injury because of the long operative time and preoperative exposure to large amounts of contrast medium. He did not fully recover, and his acute kidney injury progressed to chronic kidney disease. Because of his refusal, we did not perform a postoperative CT scan. However, he is undergoing regular outpatient follow-up and is planned to undergo an additional operation when symptoms occur. Besides this case, RTAD due to fracture of the bare spring of a thoracic endograft is very rarely reported in the English literature. In conclusion, RTAD following TEVAR is one of the most devastating complications associated with high mortality rates. A thoracic endograft was placed in the acute curve of the aortic arch, resulting in a misaligned deployment, which induced fracture of the bare spring. On the basis of our experience with this case, prudent patient selection and careful thoracic endograft deployment are necessary. Fig. 1. (A) CT scan taken 22 months previously showing chronic descending dissection in the descending aorta (white arrow). (B) Chest CT angiography scan showing type B aortic dissection from the left subclavian artery to the iliac arteries. White arrow shows the proximal entry site. (C) Chest CT angiography scan showing that the thoracic endograft is positioned about 50 mm from the proximal entry, about 45 mm behind the left subclavian artery based on the greater aortic curvature. The proximal entry site was successfully excluded. (D) Chest radiograph showing that the thoracic endograft is well positioned in the descending aorta. CT, computed tomography. Fig. 3. (A) Sagittal view of the initial CT scan showing that the aortic arch and descending aorta are acutely angulated, leading to an obvious bird-beak formation (white arrow). (B) CT scan reconstruction, posterior view. The CT scan shows distortion of the configuration of the bare spring of the previously implanted endograft (white arrow). (C) CT scan reconstruction, superior oblique view. This view leads to a strong suspicion of fracture of the bare spring of the previously deployed endograft (white arrow). CT, computed tomography. Fig. 5. (A) Postoperative chest radiograph. (B) White arrow indicates the cut bare spring. The remnant bare spring and the membranous part of the thoracic endograft in the descending aorta are left anchored onto the descending aortic wall. Dake MD, Miller DC, Semba CP, Mitchell RS, Walker PJ, Liddell RP. Transluminal placement of endovascular stent-grafts for the treatment of descending thoracic aortic aneurysms. N Engl J Med 1994;331:1729-1734. Zhang L, Zhao Z, Chen Y, Sun Y, Bao J, Jing Z, et al. Reintervention after endovascular repair for aortic dissection: a systematic review and meta-analysis. J Thorac Cardiovasc Surg 2016;152:1279-1288.e3. Chen Y, Zhang S, Liu L, Lu Q, Zhang T, Jing Z. Retrograde type a aortic dissection after thoracic endovascular aortic repair: a systematic review and meta-analysis. J Am Heart Assoc 2017;6:e004649. Dong Z, Fu W, Wang Y, Wang C, Yan Z, Guo D, et al. Stent graft-induced new entry after endovascular repair for Stanford type B aortic dissection. J Vasc Surg 2010;52:1450-1457. Neuhauser B, Greiner A, Jaschke W, Chemelli A, Fraedrich G. Serious complications following endovascular thoracic aortic stent-graft repair for type B dissection. Eur J Cardiothorac Surg 2008;33:58-63. Ma T, Dong ZH, Fu WG, Guo DQ, Xu X, Chen B, et al. Incidence and risk factors for retrograde type A dissection and stent graft-induced new entry after thoracic endovascular aortic repair. J Vasc Surg 2018;67:1026-1033.e2. Hirano K, Tokui T, Nakamura B, Inoue R, Inagaki M, Maze Y, et al. Retrograde ascending dissection after thoracic endovascular aortic repair combined with the chimney technique and successful open repair using the frozen elephant trunk technique. Vasc Endovascular Surg 2018;52:80-85. Williams JB, Andersen ND, Bhattacharya SD, Scheer E, Piccini JP, McCann RL, et al. Retrograde ascending aortic dissection as an early complication of thoracic endovascular aortic repair. J Vasc Surg 2012;55:1255-1262. Eggebrecht H, Thompson M, Rousseau H, Czerny M, Lönn L, Mehta RH, et al. Retrograde ascending aortic dissection during or after thoracic aortic stent graft placement: insight from the European registry on endovascular aortic repair complications. Circulation 2009;120:S276-S281. Canaud L, Ozdemir BA, Patterson BO, Holt PJ, Loftus IM, Thompson MM. Retrograde aortic dissection after thoracic endovascular aortic repair. Ann Surg 2014;260:389-395. Dong ZH, Fu WG, Wang YQ, Guo DQ, Xu X, Ji Y, et al. Retrograde type A aortic dissection after endovascular stent graft placement for treatment of type B dissection. Circulation 2009;119:735-741. Kpodonu J, Preventza O, Ramaiah VG, Shennib H, Wheatley GH 3rd, Rodriquez-Lopez J, et al. Retrograde type A dissection after endovascular stenting of the descending thoracic aorta. Is the risk real?. Eur J Cardiothorac Surg 2008;33:1014-1018. Fattori R, Nienaber CA, Rousseau H, Beregi JP, Heijmen R, Grabenwöger M, et al. Results of endovascular repair of the thoracic aorta with the Talent Thoracic stent graft: the Talent Thoracic Retrospective Registry. J Thorac Cardiovasc Surg 2006;132:332-339. Fattori R, Lovato L, Buttazzi K, Di Bartolomeo R, Gavelli G. Extension of dissection in stent-graft treatment of type B aortic dissection: lessons learned from endovascular experience. J Endovasc Ther 2005;12:306-311. Higashigawa T, Kato N, Chino S, Hashimoto T, Shimpo H, Tokui T, et al. Type A aortic dissection after thoracic endovascular aortic repair. Ann Thorac Surg 2016;102:1536-1542. Weng SH, Weng CF, Chen WY, Huang CY, Chen IM, Chen CK, et al. Reintervention for distal stent graft-induced new entry after endovascular repair with a stainless steel-based device in aortic dissection. J Vasc Surg 2013;57:64-71. Ishimaru S. Endografting of the aortic arch. J Endovasc Ther 2004;11 Suppl 2:II62-II71.